This apartment building overlooks the Roman Catholic Church of St. Ignatius Loyola and its school and related facilities on the avenue block just to the north. The red-brick building was erected in 1912 as a 12-story building and was converted to a cooperative in 1987 by Martin J. Raynes who added two triplex penthouses with circular staircases, "greenhouse" studies and large terraces. The top of the building has an exposed watertank. Raynes made a similar addition of penthouses to 525 Park Avenue and while both resulted in impressive new apartments, they did not, unfortunately, relate contextually to their buildings even if they are setback on the roofs. It has 43 apartments, which have fireplaces and high ceilings, and a two-story limestone base. The building, which has an attractive two-story-high, limestone-framed entrance and protruding air-conditioners, was designed for Bing & Bing by Schwartz & Gross, whose other buildings on the avenue include 470, 525, 885, 888, 911, 930, 941, 983, 1045, 1070, 1095, 1125 and 1165. 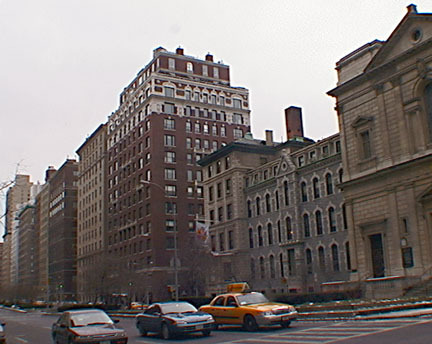 The building, which has no garage, is not far from the Metropolitan Museum of Art on Fifth Avenue and there are other schools and religious institutions nearby. Cross-town buses run on 86th Street and an express subway station is at Lexington Avenue and 86th Street.